South Kesteven Amateur Radio Society (SKARS) is based in Grantham, Lincolnshire but is active throughout the surrounding region. Formed in 2011 it has an enthusiastic membership eager to embrace and experiment with emerging technology as well as traditional radio communication. SKARS is affiliated to the Radio Society of Great Britain. The RSGB is the national organisation for amateur radio enthusiasts. Like all societies affiliated to the RSGB SKARS is dedicated to the development of the science and practice of amateur radio. We endeavour to increase awareness and understanding of amateur radio and to make the hobby accessible to everyone. RSGB membership is not a requirement of being a member of SKARS but is open to all who have an interest in radio communications. Membership gives you a voice in how amateur radio is governed in the UK and the opportunity to influence the direction and policy of the RSGB. The RSGB is a membership-focused organisation. The RSGB is organised on a Regional basis and there is a small team of volunteers in each Region called Regional and Deputy Regional Managers. 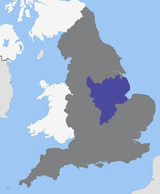 SKARS is a member of Region 13 which overs the East Midlands area of central England, from Derbyshire in the north, to the southern portion of Lincolnshire, down to Northamptonshire. Please check the club calendar for the times of future meetings and event information.